Net TV for Windows 7 - service for viewing TV programs from around the world. The application includes a built-in video player with support for the functions of pause and change the quality of the stream received, can play audio files and play Internet radio stations. 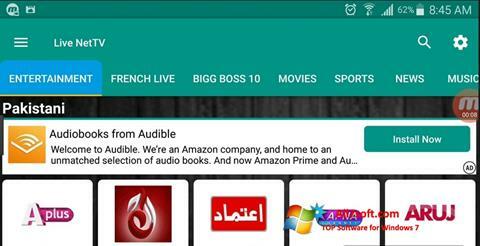 The program uses its own catalog of TV channels, can display programs by country or subject of broadcasting, supports automatic updating and the ability to add third-party links. The player has an interface in the style of Windows, can form a list of favorite channels based on the frequency of views and check the performance of broadcasts when you start the application. You can free download Net TV official latest version for Windows 7 in English.